We did the ol’ rise and shine and took a trip down the road to our Dekalb favorite, the Hillside Café. With full bellies and a full tank of gas, we set out for our home-away-from-home, Champaign, IL. 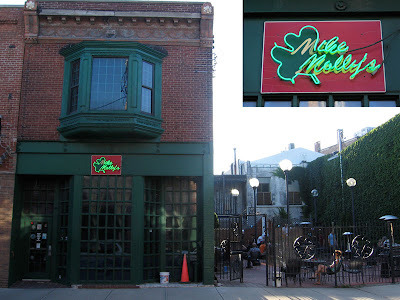 After the short trip to CU, we bummed around our favorite establishments before making our way over to Mike N’ Molly’s, where we had only been once before – to see Jumbling Towers play. 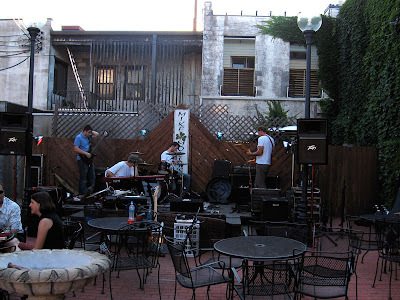 We met the guys in Sangamon outside the gate of the outdoor patio, where we would be playing in a few hours. We loaded our gear to the side of the stage and enjoyed the beautiful weather while Sangamon set up and soundchecked. The patio filled up quickly as the night went on, and the bands seemed to enjoy playing to the abundant yet attentive show-goers. Larry Gates (formerly of Lorenzo Goetz) put on an especially entertaining show with his one-man-band project, Curb Service, which brought to mind early Beck and Soul Coughing. The audience was exuberantly receptive to our set, as every song garnered loud applause, and many audience members expressed their excitement after the show. Thanks Champaign, you consistently treat us so well. Afterwards we shacked up with our favorite newlyweds, Ryan and Jody. You guys rule.